(CelebrityAccess News Service) — Dan Aykroyd and Jim Belushi have released Have Lost Will Travel on their own label Have Love Records, which was formed with Doyle-Kos Entertainment, their management company. It is distributed by Red Distribution, a subsidiary of Sony music). "This record is sheer fun and revives great memories," stated DKE co-founder Rob Kos. Recorded in the Midwest and mixed at the Ethera/Zamorra studios in New Mexico, USA, Have Love Will Travel contains twelve songs which represent years of searching for material by Aykroyd and Belushi. "The criteria were songs with a certain wryness and humor linked to up sounding beats and tempos and opportunities where we can feature the talents in our all star master show band," says Belushi. "We are having a ball with this thing. We are excited about some of the guest stars who we'd love to have join in. If we were in school James Brown is our principal, Little Richard is our home room teacher and Bobby Bland is our spiritual advisor." 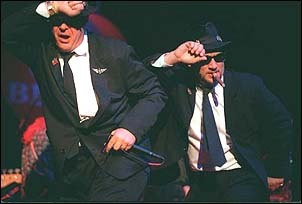 The revue features Aykroyd and Belushi on tour as vocalists, dancers, musicians as well as the shows co-emcees. The ten musicians they have assembled include bassist Larry Lerma, guitarist Johnny Lee Schell, guitarist J.J. Holiday, pianist Glen Clark, saxophonist and composer Joe Sublett, Jimmie Wood on harmonica, Darrell Leonard on trumpet, drummer Tony Braunagel, trumpet player Johnny Rubano, and vocalist Julie Delgado. Each musician involved has lent their talent to numerous other musical acts ranging from Etta James to Bruce Springsteen to Gladys Knight and Elton John. Aykroyd and Belushi laud the musicians as "the gems in the act." Aykroyd adds, "The show highlights fast blues/jump swing/R&B and rock with some 70's pop tunes, a country take on a Beatles song, and anti-war shout and lots of great American delta-Chicago type standards. There is also some cool original material from Glen Clark, Tony Braunagel and Jim Belushi. Even I got to compose a little. These are songs we sang as kids. We're fifty now so this is us recapturing the summer radio memories of places and things we were doing when we heard evocative anthems like 'Polk Salad Annie' and 'Time Won't Let Me.' We'd like people to travel there with us." "We're suburban baby boomers who fell in love with icons like all the Stax/Volt, Chess and Atlantic stars and had to start high school and college bands to pay homage to these earth shaking artists," observes Belushi. to present our glistening wares which are our players and these classic American songs," adds Aykroyd.